This entry was posted in pistol, rkba, self-defense, weapon and tagged 9x19, bersa, Taekwondo, Thunder. Bookmark the permalink. That’s beautiful motion on this one! As I recall, TKD prefers open-hand strikes to closed fists..
it probably depends on your teacher. i was taught alot of open hand techniques but the focus was punching, as far as hand techniques goes. kicking is really the focus of tae kwon do though. Great capture of motion and great message. Great action pose/shot. Not sure what you call it exactly but it looks great and conveys lots of energy. Check your web site, seems it got hacked. The model’s wrist isn’t straight, he’s going to break it if that punch lands. 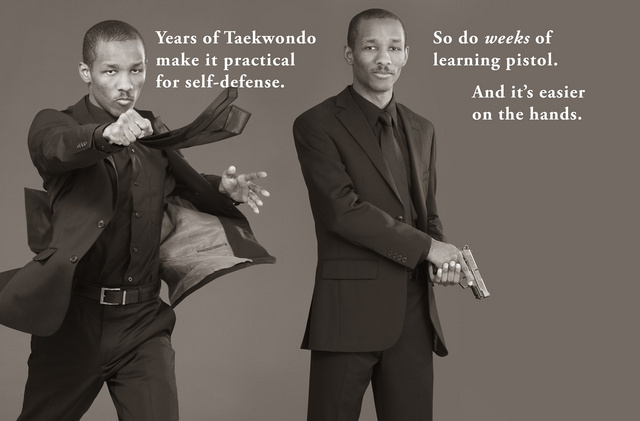 I’ve been training in the martial arts for 26 years and have been shooting for way more than that. My experience has been that situational awareness, training under stress, and knowledge of use-of-force laws are way more important than the particular tool(s) used for self-defense (although certain tools are easier on your wardrobe than others ;). A great website addressing these issues that I’ve found very useful is http://www.nononsenseselfdefense.com. Great capture of the motion, by the way! Love the action shot! Very dynamic and dramatic. The only problem is, the model needs a little more Taekwondo training. It is very easy to break your own fingers and wrist when hitting a real opponent with incompletely formed fist like this one. The Model in this picture is leading with the last three knuckles of his fist and has his hand at a 45 degree angle. For fighting this is required because the correct muscles used for punching are the shoulders and triceps. It is easier and more likely to break ones wrist and knuckles while hitting with the wrist horizontal and leading with the first two knuckles. Should the practitioner make a mistake or the wrist bend in any way, the force is pushed back on to the bend of the elbow and the bicep which is not engaged during the punch. This causes the weight of the person punching to be collected in the wrist and fingers. Leading with the bottom 3 knuckles and punching at a 45 degree angle allows for force to be transferred from the fist, to the triceps and into the shoulder. As well as a more clean follow through. Moreover, it is true that Tae Kwon Do does not teach it’s students to punch in this manner. One could assume that the model either does not study Tae Kwon Do or uses an different style of Martial Art in regard to the manner in which he punches. I was told by my sensei in Shotokan Karate that for safety, a punch has to connect using the first two knuckles; a punch that connects with the knuckles of the ring and little finger is more likely to break the hand bones because they are not supported through the hand to the wrist and the forearm like the other two knuckles. I’ve been carrying a firearm, and seeking training, since I was a 1 striper in the Air Police. I spent a year in training when I was assigned to Taiwan. Chinese martial arts are, or were for me, designed to avoid being struck, and we did lots of parries, blocks, and so on. I trained on the quarterstaff for a short time, but a man of 65 years old or more put more lumps on me than I can count, all the while screaming in Chinese. The point is, there are going to be times when those avoidance moves and parries will allow you to go to the gun. They may, in and of themselves, save you from having to go to the gun or an edged weapon. Your job is to safely return home to your family, while using the minimum force necessary to thwart the bad guy. Lamentably, sometimes that minimum force is a 230 grain hollowpoint .45 driven through the skull of a bad guy. Nobody can train you for the pain and agony of taking a life. Its not so easy as simply pulling a trigger. On the other hand, he who hesitates is dead. Jack up you radar, your situational awareness. Avoiding trouble is best. Having a plan to combat a threat to life and limb is “bestest”. My plan does include a firearm. Though, I’m not sure how good a gun is for SD compared to MA, if the enemy is within arm’s reach. What this thread has taught us is that the biggest risk of defending yourself with any type of bare-handed martial art is that afterwards, everybody around who’s ever spent fifteen minutes in a McDojo is going to stand there and critique the form you used to punch the goblin’s lights out. I’ve done Okinawan Goju and Tae Kwon Do and after 21 years in the Army I’ve decided that armed combat beats unarmed combat any day. If Joe Criminal has gotten close enough to punch he is close enough for me to hook an eye with my thumb or to kick him in the knee to slow him down. I don’t punch the head, it’s too hard on the hands, I go for soft targets like the throat and solar plexus. Is a throat punch any good? That and pummeling faces of classmates who tried taunting me in grade school and weren’t formidable. The adrenaline high was exhilarating, but after several fights the taunting ceased. Yes, if your intent is to maim or kill your opponent. So, if you are involved in a minor shoving match in a bar, don’t hit there. Reserve it for those desperate times when dealing with multiple attackers, or someone who is clearly attempting to kill you. Great response Tam, seems as though the intent of the post got a bit sidetracked. Doesn’t the old saying go…don’t bring a fist to a gunfight.